Before performing cost audit, the cost auditor must have or obtain knowledge of the industry and its business environments, sufficient to enable him to identify and understand the events, transactions and practices that in the cost auditors judgment, may have a significant effect on the -cost accounting statements of the entity to be audited, or on the cost audit report. The cost auditor should also have a general knowledge of the country’s economy and the industry within which the entity operates. He should also have a clear understanding of the conditions that affect or may be affecting the cost and profit performance of the entity. The knowledge that the cost auditor obtains about the industry and the entity at the planning stage of the cost audit, keeps increasing and updating, while taking up the assignment and at every stage throughout the performance of cost audit. The cost auditor keeps re-valuating the knowledge and information gathered earlier. Knowledge of the industry, which the cost auditor may already have may be updated through discussions with the entity’s senior operating personnel, publications relating to the industry, government surveys, statistics, trade journals, visit to the entity’s premises and plant facilities. Knowledge of the industry and the entity is extremely important in cost performance evaluation. The cost auditor should ensure that the assistants assigned to a cost audit engagement also obtain sufficient knowledge of the business to enable them to carry out the cost audit work delegated to them. It should be ensured that they understand the need to be alert for additional information and the need to share that information with the principal and other assistants. When planning and performing cost audit procedures, the cost auditor should keep in view the legal and regulatory framework within which the entity has to operate. Although it is the responsibility of management to ensure that the entity’s operations are conducted in accordance with the laws and regulations, the cost auditor cannot be held responsible for preventing non-compliance by the entity; he should see that the provisions of the Companies Ordinance 1984, the relevant cost accounting record order and of the Companies (Audit of Cost Accountings) Rules 1998 as far as they relate to the maintenance of the accounting record and providing of cost accounting information, are duly observed and followed by the entity. Non-compliance of such provisions by the entity would have a material effect .on the cost accounting statements, in which case the cost auditor is specifically required to report, whether or not the entity complies with the provisions of laws or regulations, which are directly related to cost audit. While taking up any new cost audit assignment, the cost auditor should, first of all, study the organizational set-up of the entity. He should get familiar with the administrative, financial, buying and selling, production and planning functions at the entity. He should be introduced to the functional heads, as he will be dealing with them during the course of cost audit. Each function and sub-function should be organized in a logical manner, according to its nature and size. 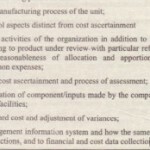 The size of and the manner in which the various functions are organized have a direct bearing on the cost of each function performed at the entity, The cost auditor will do well in discussing the functional set-up with the top management, pass on the concept of activity-based costing and also offer comments on the set-up, if considered necessary, under the circumstances. Knowledge of the organizational set-ups of each function helps in obtaining knowledge of the industry and the entity, referred to in the foregoing paragraphs. The cost auditor has also to verify and express opinion on the company representations made under the Companies (Audit of Cost Accounts) Rules 1998 and on the cost accounting information provided by the. company, in the Schedules and Annexures prescribed in the cost.__ accounting records rules applicable. He has also to evaluate and offer comments on the entity’s cost accounting system. He thus has to work, maintaining close liaison with the functional heads and with various levels of management. 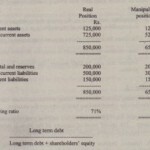 “(2) the statements specified in clauses (a) and (b) of sub-rule (1) shall be signed by the chief executive and chief accountant of the company.” Both the statement specified in clauses (a) and (b) shall be submitted along with the Cost Auditors report Capacity as explained explained in para (1) of Appendix 111 of the Rules: “1. Capacity: (a) Licensed, installed and utilized capacities of the factory or factories for the product under reference. After checking the stock in process at the end of the financial year with the production records and after adjusting the opening stock in process of last year closing stock-in-process. “production in quantities of each type of product under reference” should be worked out, as required in para 3(a) of Appendix 111 (sub-rule (3) of rule 4) of the Companies (Audit of Cost Accounts) Rules 1998″. The cost auditor has to follow the International Audit Standards (lASs) and related technical pronouncements issued by International Federation of Accountants. Cost audit, like any other audit involves: (a) planning (b) carrying out audit procedures or gathering cost audit evidence and (c) drawing reasonable conclusions on which to base the audit opinion. The principles and planning have generally been explained in Section III and of this Handbook, respectively. During the course of audit, the cost auditor should obtain sufficient appropriate audit evidence for arriving at reasonable conclusions. Audit evidence is the documented information obtained by the cost auditor in arriving at the conclusions, on which the audit opinion is based. Audit evidence will consist of source documents, cost accounting records, cost accounting statements, company representations and corroborating information from other sources. Cost audit procedures mean tests to obtain cost audit evidence to detect material misstatements in the statements and in the information provided by the entity. The tests may be performed on the details of transactions and balances, following analytical procedures. When obtaining cost audit evidence from substantive procedures, the cost auditor should consider the sufficiency and appropriateness of audit evidence from such procedures, together with any evidence from tests of control to support the cost and other information asserted by the management of the entity. If unable to obtain sufficient appropriate cost audit evidence, however, the cost auditor should express a qualified opinion or a disclaimer of opinion. How Cost audit evidence is obtained? their processing Documentary cost audit evidences may be created by third parties and held by third parties or held by the entity or created by the entity and held by the entity. (ii) The cost auditor may observe the procedures being performed, say the counting of inventories by the entity’s personnel, Inquiry consists of seeking information of knowledgeable persons inside or outside the entity. Inquiries may be written or oral, providing new or corroborative information. Confirmation is the response to an inquiry. (iii) Computation consist of checking the arithmetical accuracy of source documents and cost accounting records or of performing independent calculations. Analytical procedures consist of significant ratios and trends, including the resulting investigation of fluctuations and relationships that are inconsistent with other relevant information or deviate from predicted amounts. Analytical procedures include the consideration of comparison of the entity’s cost information for prior periods, anticipated results of the entity, such as budgets or forecasts or expectations of the cost auditor, such as an estimation of depreciation. The entity’s cost performance may also be compared with similar industry cost information. system is tested to identify the characteristics or attributes that indicate performance of a control, as well as possible deviation, conditions, which indicate departures from adequate performance. The cost auditor should perform audit procedures appropriate to the particular test objective on ea.ch item selected. control, used by management in making the control yardstick is important for the cost auditor, to plan the nature, timing and extent of the cost audit procedures. The cost auditor should either review and test the process used by management to develop the standard; use an independent standard for comparison with that prepared by management or review subsequent events which confirm the standards made. knowledge of the business and whether the yardstick is consistent with other audit evidence obtained during the audit. After an evaluation of results of cost audit procedures, the auditor should feel convinced of their being reasonable. Vouching, testing, examining, analyzing, comparing, confirming, inspecting, reconciling, tracing, verifying the details, the cost auditor collects audit evidence to form his opinion not only about the production and capacity utilization, but also on the cost accounting statements prepared by management in accordance with cost accounting records order/rules, applicable to the industry. Cost statements differ from industry to industry and reflect how production and auxiliary services are generally organized. (viii) The cost audit procedures outlined in the foregoing paragraphs are not only performed on the statements submitted by the company under the Companies (Audit of Cost Accounts) Rules 1998, but they are. also performed on the cost accounting records which the industry has to maintain under the cost accounting records order/rules. The cost accounting records orders rules specifically mention the principal elements of cost involved in the production of the relevant product, and specify adequate and proper accounting records for the same. The principal elements of cost, generally relevant to various industries, are discussed in the next Chapter.